The dsp.Differentiator System object™ applies a fullband differentiator filter on the input signal to differentiate all its frequency components. This object uses an FIR equiripple filter design to design the differentiator filter. The ideal frequency response of the differentiator is D(ω)=jω for −π≤ω≤π. You can design the filter with minimum order with a specified order. This object supports fixed-point operations. Create the dsp.Differentiator object and set its properties. DF = dsp.Differentiator returns a differentiator, DF, which independently filters each channel of the input over time using the given design specifications. DF = dsp.Differentiator(Name,Value) sets each property name to the specified value. Unspecified properties have default values. true — The object designs the filter with the minimum order that meets the PassbandRipple value. false — The object designs the filter with order that you specify in the FilterOrder property. Order of the filter, specified as an odd positive integer. You can specify the filter order only when 'DesignForMinimumOrder' is set to false. Maximum passband ripple in dB, specified as a positive real scalar. You can specify the passband ripple only when 'DesignForMinimumOrder' is set to true. Option to scale the filter coefficients, specified as a logical scalar. When you set this property to true, the object scales the filter coefficients to preserve the input dynamic range. Word and fraction lengths of coefficients, specified as a signed or unsigned numerictype object. The default, numerictype(1,16), corresponds to a signed numeric type object with 16-bit coefficients. To give the best possible precision, the fraction length is computed based on the coefficient values. The word length of the output is the same as the word length of the input. The object computes the fraction length of the output such that the entire dynamic range of the output can be represented without overflow. For details on how the object computes the fraction length of the output, see Fixed-Point Precision Rules for Avoiding Overflow in FIR Filters. y = DF(x) applies a fullband differentiator filter to the input signal, x. y is a differentiated version of x. Data input, specified as a vector or a matrix. If the input signal is a matrix, each column of the matrix is treated as an independent channel. The number of rows in the input signal denotes the channel length. The data type characteristics (double, single, or fixed-point) and the real-complex characteristics (real or complex valued) must be the same for the input data and output data. Differentiated signal, returned as a vector or matrix of the same size, data type, and complexity as the input signal, x. Estimate the group delay of a linear phase FIR filter using a dsp.TransferFunctionEstimator object followed by dsp.PhaseExtractor and dsp.Differentiator objects. The group delay of a linear phase FIR filter is given by , where is the phase information of the filter, is the frequency vector, and N is the order of the filter. 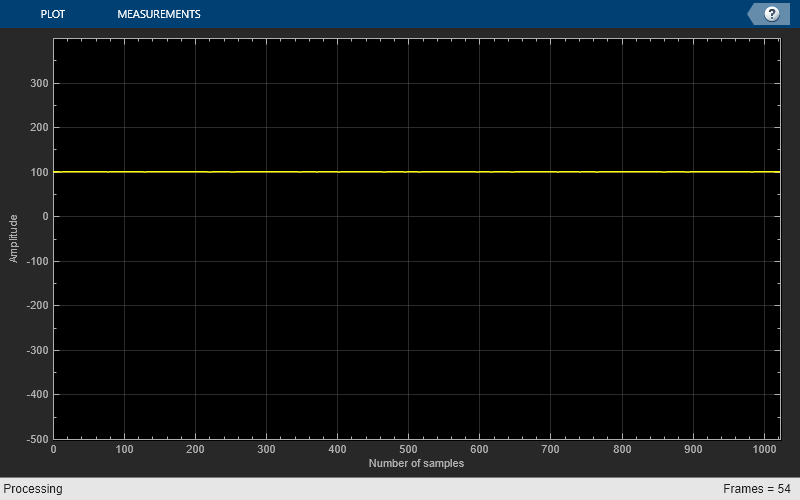 Create a linear phase FIR lowpass filter. Set the order to 200, the passband frequency to 255 Hz, the passband ripple to 0.1 dB, and the stopband attenuation to 80 dB. Specify a sample rate of 512 Hz. To estimate the transfer function of the lowpass filter, create a transfer function estimator. Specify the window to be Hann. Set the FFT length to 1024 and the number of spectral averages to 200. To extract the unwrapped phase from the frequency response of the filter, create a phase extractor. To differentiate the phase , create a differentiator filter. This value is used in computing the group delay. 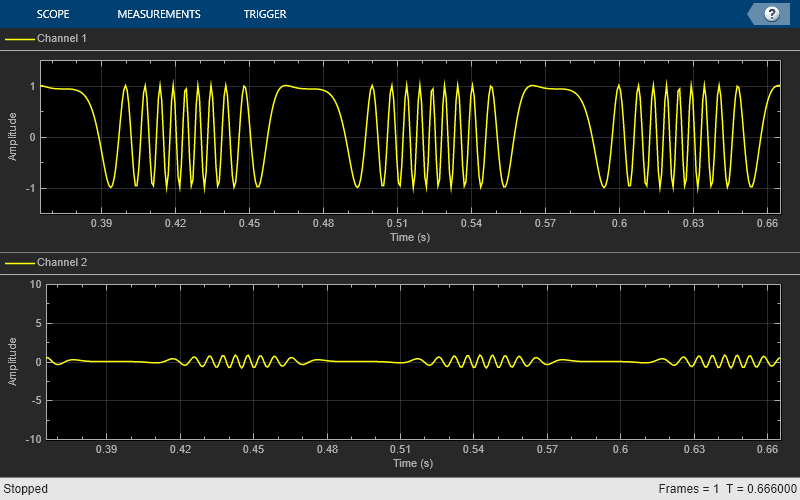 To smoothen the input, create a variable bandwidth FIR filter. To view the group delay of the filter, create an array plot object. The for-loop is the streaming loop that estimates the group delay of the filter. In the loop, the algorithm filters the input signal, estimates the transfer function of the filter, and differentiates the phase of the filter to compute the group delay. As you can see, the group delay of the lowpass filter is 100. Create an FM wave on a 100 Hz carrier signal sampled at 1.5 kHz. Convert the FM signal to an AM signal. Differentiator computes the derivative of a signal. The frequency response of an ideal differentiator filter is given by D(ω)=jω, defined over the Nyquist interval −π≤ω≤π. The frequency response is antisymmetric and is linearly proportional to the frequency. 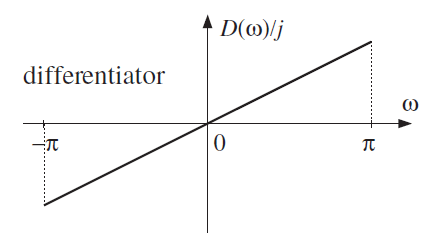 dsp.Differentiator object acts as a differentiator filter. This object condenses the two-step process into one. For the minimum order design, the object uses generalized Remez FIR filter design algorithm. For the specified order design, the object uses the Parks-McClellan optimal equiripple FIR filter design algorithm. The filter is designed as a linear phase Type-IV FIR filter with a Direct form structure. The ideal differentiator has an antisymmetric impulse response given by d(n)=−d(−n). Hence d(0)=0. The differentiator must have zero response at zero frequency. The impulse response of an antisymmetric linear-phase FIR filter is given by h(n)=−h(M−1−n), where M is the length of the filter. Because the filter is antisymmetric, you can use this type of FIR filter to design the linear-phase FIR differentiators. Consider the design of linear-phase FIR differentiators based on the Chebyshev approximation criterion. If M is odd, the real-valued frequency response of the FIR filter, Hr(ω), has the characteristics that Hr(0) = 0 and Hr(π) = 0. This filter satisfies the condition of zero response at zero frequency. However, it is not fullband because Hr(π) = 0. This differentiator has a linear response over the limited frequency range [0 2πfp], where fp is the bandwidth of the differentiator. The absolute error between the desired response and the Chebyshev approximation increases as ω increases from 0 to 2πfp. If M is even, the real-valued frequency response of the FIR filter, Hr(ω), has the characteristics that Hr(0) = 0 and Hr(π) ≠ 0. This filter satisfies the condition of zero response at zero frequency. It is fullband and this design results in a significantly smaller approximation error than comparable odd-length differentiators. Hence, even-length (odd order) differentiators are preferred in practical systems.